Greetings all. Jim Thomas is in Detroit with the team, and I expect him to be posting the Morning Skate report shortly. It looks like Alexander Steen is back in the lineup, with Sammy Blais coming out. The novocaine is wearing off from my two hours in the periodontist's chair this morning (that's like a dentist who more complicated things) , so that's probably going to put me in a fine mood. But that may be nothing compared to the mood of Blues' fans coming off Saturday's game, so let's go. Hello. Is Jake Allen starting in goal tonight for sure? That's what Jim is saying from Detroit. Johnson didn't exactly have a great game against Winnipeg. Would the Blues consider tearing down the roster and starting over? See what they can get in trade for Petro? See what they can get for Vladdy? Move the touted but underachieving Parayko along? Give away their goalie (puh-leeze)? And go through a couple seasons of mediocre play? I don't think that would go over very well, and this is a team that needs to sell tickets to get by. Maybe you can make one or two deals of a high-profile player, but a tear down seems a bit much. And, as Jeff Gordon pointed out this morning, and as I noted on this week's podcast, there's a lot of talent on this team. It's not like Tarasenko suddenly became bad. Now, the goalie issue is another thing. Allen had some fuzzy moments at the start, where a big save or two in a game may have kept games closer and changed the course of games, but he's done pretty well lately and has kept them in games. He's allowed more than two goals in only one of his past six appearances. Though we haven't gotten to late December yet. We all know Stillman trusts Armstrong, but who would he listen to/turn to about making a change at GM if the season is an disaster? MacInnis? Not talking about who would take the GM spot, but who Stillman would seek out for advice on new management. I think Stillman would probably see that on his own. He knows hockey well enough to know what's working and what isn't and what the team can afford. But, remember, a lot of people thought this team had the makings of a very good squad. The crowd at the Icebreaker event at Ballpark Village showed that. They apparently felt the moves Armstrong made were the good ones. Mr. Timmerman -- Seeing veteran players like Bouwmeester and Steen have dropoffs in performance is unfortunate, but predictable. They're near the end of the line. I appreciate the contributions they have made to the Blues in the past. What is troubling, and frankly infuriating, is seeing players who should be ascending on in their primes, struggling so badly.Yes, that would be Pietrangelo, Tarasenko, Parayko, Schwartz (before he was hurt) and Allen. That tells me something isn't right with this team internally - whether it is the players, management, ownership, culture, maybe all of the above. What say you? Why do you think these players are regressing, even though Allen has played a little better lately? The team may need a therapist more than a coach. It's a very good collection of players, which some how hasn't come together well. So maybe it's the chemistry. Maybe there are hidden resentments that affect how players interact on the ice. In Tarasenko's case, he's actually expanded his game, doing more away from the puck, that the coaching staff was pretty happy with. Yeo loved his last shift in the Chicago game, which ended with Tarasenko blocking a shot at an empty net that almost took his head off. So he's being more of a leader, but he's scoring less, which is what he's getting paid for. (Though when he doesn't play defense, that doesn't go over well.) Based on talent alone, this team should be doing much better. Parayko, by the way, had more minutes than Pietrangelo on Saturday against Winnipeg. What is the update on Burtuzzo and Schwartzy? Blues could really use both of those guys back in the lineup ASAP, especially Bortuzzo with his style of physical play. Thanks. Bortuzzo is close. He was going all out in practice yesterday and looked ready. He's not in the lineup today, but he could very well play in one of the final two games on this trip. It's amazing to think that the absence of Robert Bortuzzo has become an issue for this team, and he's played only five games, but it has. One other issue with him is that he hasn't played since Oct. 20, so he might need a bit more time to get back into game shape once he's ready. As for Schwartz, no update other than he's on the ice. I haven't seen him skate, but the last time I saw him in the press box, he had a glove/wrap on his left hand. Assuming no more injuries, do you think get Blais gets sent down once Bortuzzo is activated? If we ever get to full health, would have to imagine a Schmaltz trade or exposing Sochnikov to waivers. See it differently? Yesterday, I would have said they would send Soshnikov down. He hardly plays and when he does, it's not for very long. The issue would be if they felt they could get by with only one extra forward. However, with Steen back and Blais moving to being a healthy scratch, I could see Blais getting sent down so he could keep playing. I would think at this point, Soshnikov has a good chance to make it through waivers. Allen might be playing decent as of late, but he's a headcase. I would have rather kept Hutton, traded Allen for a bag of pucks, and looked for a better backup. Hutton came with an inherent risk, at least as far as the Blues saw it, that in his NHL career he had never been a starter. Also, I don't know what the market was for Allen, even if all you wanted was a bag of pucks. The Blues apparently had satisfied themselves that Allen could deal with is December, January adventures. Again, we haven't even gotten that far yet to see how that part of this is going to play out. But the Blues could have only kept Hutton if they got rid of Allen, and they were committed to Allen. Hutton had a year that earned him more money than the Blues were willing to commit to the position. Jordan Binnington put up strong numbers in Providence last season, and has better numbers than Husso in San Antonio this season. Still, he does not seem to get a second thought from the Blues. Do they not consider him to be a prospect anymore? Husso's play has made him the consensus No. 3 goalie, though things change and that's what the AHL is for. It was hard to compare last season since Husso and Binnington were on different teams, with different defenses and got different playing time. If this year keeps going the way it is, Binnington could become the guy, though it seems the team thinks that as Husso gets more comfortable playing in North America, and gets more time, he's got the better long-term potential. But again, things change. What do you make of the Blues not winning any 1-goal games so far this year? To me, that speaks to the lack of mental toughness, and lack of desire to compete when things are tough. Again, it possibly goes back to team chemistry. I like this group of players personally, but sheesh...it's no fun and not entertaining when too many games aren't even close. It is an oddity. They are the only team in the league without a one-goal win this season. They had three games early that went to overtime that they didn't win. Early on, the issue was that they were blowing leads, which seems to me the bigger issue. After all, if they had given up a late goal to Calgary on Oct. 11 or a late goal to Vegas on Nov. 1, both games they won by two, those could have been one-goal wins. So winning by two in those games may say just as much about mental toughness. But blowing the leads they did against Chicago or Anaheim early I think speak more to the issue. On the other hand, they haven't blown many leads lately, mostly because they're falling behind more quickly. You guys miss the Rams? What is the deal with Parayko?! He was better as a rookie. Does he just not like it here? Because he plays like a guy who wants to be traded. Thanks. Actually, I think Parayko has bought a house here. It could be the curse of having a big rookie year -- in his case, it was a big first few weeks -- that lifted expectations. But he has become a minutes eater, regularly being up there with Pietrangelo for ice time. The Blues have gone with Pietrangelo and Dunn on the power play a lot, which has cost him some scoring chances, but he also has made some defensive mistakes that have loomed large. But he's certainly not alone on this team in that department. Pretty much everyone on the defense seems to have at least one mistake that's led to a game-winning goal. Have you heard any trade chatter other than Maroon? I’m surprised we haven’t heard anything about Steen, Pietrangelo, Parayko and Allen? How come management hasn’t called out the locker room debacle between Steen and Pietrangelo? Don’t you think some that would shake them up a bit? With the salary cap situation and the no-trade clauses, any trade will be hard, and while Maroon might be attractive to other teams because of his salary, it would limit what you could get in return since the Blues couldn't get more than a player making more than $1.75 million coming back, which in today's NHL isn't that much. (It wouldn't even get you Carl Gunnarsson.) The team sent the players a message by firing Yeo, and I think they'll let that sit for a while and that doesn't change things, then making a trade is the next move. I'm sure for the right offer, Armstrong would consider almost any, but you don't want to trade someone that you're going to look stupid for trading down the road if you don't get a good return. It takes two. Yeah, we weren't expecting that one. The press corps had him tabbed as someone not making the team out of camp based on last season, but he's made definite progress. Dreger is reporting that we're looking at Jimmy Howard. Heard anything in regards to this, and what would we be willing to give to get him? Usually in season when you get a goalie, you trade a goalie, because otherwise one team ends up with three of them and then has to do something else. Howard, in the last year of his contract and a UFA after his season, makes $5.2 million, so you'd have to be close to that on the money. If the Blues were in fact interested in Howard, and I have no idea if they are, they would have to be very confident about re-signing him or very confident in Ville Husso or someone in the free agent market. Another thing that has been disappointing about the Blues start: Ryan O'Reilly has been terrific. By any measure, that was an excellent trade by Armstrong -- yet, the team stinks. Again, points to some deeper problems, doesn't it? By the way, totally agree with you about blowing the roster up. Those calling for it would be the first to complain about how bad the team is. Another reason the Blues are in a tough spot. Hard to justify a total rebuild in the St. Louis market. You could away with that in Toronto. Ryan O'Reilly has got to be wondering what dark cloud he was born under. He goes from Buffalo to St. Louis and Buffalo becomes great and St. Louis becomes lousy. Go figure. I love your writing and I am glad to see you hosting the chat! What number do you think Jack Hughes is going to wear for the Blues next year? How can a team with this many talented players be so bad? Thanks, and hard to believe I didn't answer this one earlier considering that first sentence. I have no idea how a team this talented can play so poorly. It's surprising. Jack Hughes, for those who don't know, may be the No. 1 pick in the NHL draft next year. The word "phenom" often appears next to his name. 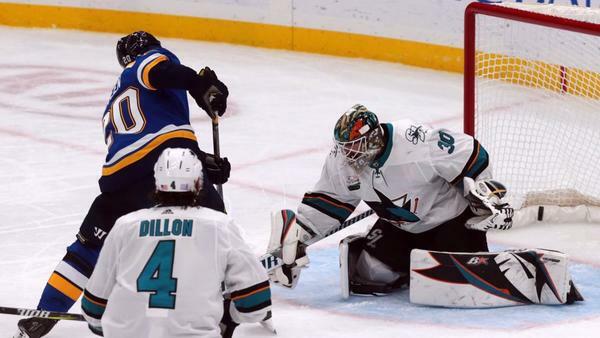 Jake Allen has given up 8 goals in last 5 games. Is the team ever going to gel? Did they need a longer pre-season? Please, not a longer preseason. Maybe more practice time, but not any games. Can this team win three in a row? What they may need more than a big win like the one over Nashville is a dramatic win, a comeback where they score two goals in the final minute then another in overtime to win. They need something special besides a one-sided game, and then they need to be able to take it and run with it. The Nashville win might have helped if they then had three days off after that, but with this team, playing Winnipeg the next day guaranteed they were going to be in trouble. We keep hearing about accountability from these players, but when you listen to Darren Pang and Bernie Federko all they do is come up with excuses for these guys. Where is the accountability? If not from the players themselves or the announcers, who then? I wish Al Hrabosky did hockey. Did I read somewhere that Buffalo gets our first round draft pick next year? It's not Darren's or Bernie's job to keep the players accountable. It's the management and the coaches and the players. If I were a player, I'd respond more to Craig Berube saying that than Darren Pang. Tom, how many times do we have to hear Pietrangelo say “We’ve got to be ready to play”, or have anyone of a number of Blues players say “lack of effort,”, or “we came out flat, not ready to play”. This is getting to be like a broken record. OK, so it appears Yeo wasn’t the problem, now it’s on the players. The worst part about this whole thing is Buffalo is #1 overall and if we end up dead last, they get our #1 draft pick. Wish we had a GM like Jason Botterill.